Lucrative markets attract new entrants unless the existing organisations have a strong barrier to entry. If it is easy to make and sell what the organisation is selling then every other organisation would love to jump in and produce the same product and market it to the consumer. The organisation should have barriers to its share of the market to stop the new entrants from taking a slice out of it. One of the best barriers is the economy of scale. Economy of scale is achieved when more products or services are obtained with the same fixed cost. A good example would be the neighbourhood bakery. The fixed cost for the bakery is the skilled bakers, the oven, and the store rent. The bakery would be losing money if they produce and sell a few items every day, but the bakery will have excellent economy of scale if the bakers work all of the time and the oven is always full of white dough turning to golden cakes and bread. The fixed cost will be distributed over multiple products and the production cost of each unit will be low. New entrant has to achieve this production and selling scale to be profitable otherwise they will not be able to enter and compete with the existing organisation. Another example of the economy of scale is the Microsoft Excel. Competitors of Excel have to be widely distributed and adopted to be able to compete. The cost of switching to Excel to another spreadsheet software has to be very low, or maybe free to attract new users. Google offered Google Spreadsheets free online and offline for all users and it is making a good gain in the spreadsheet market share. Brand name can be a useful entry barrier when new organisation try to muscle in its way into the market. In the case of spreadsheet market, both Microsoft and Google are excellent brands and will have a fair chance to compete. Product differentiation and location are strong entry barriers. Using the bakery example above would be a good illustration for these entry barriers. The bakery should have a good location and access to the costumers to make it more attractive for the customers. New competing bakery will have difficulty attacking the costumers if store is located in the back of a shopping mall or in a remote area. The customer will not go to the new bakery unless it has products the other bakery does not offer. The new bakery can specialize in birthday, wedding, and special occasion cakes which will make the costumer reach for it for that special social event. 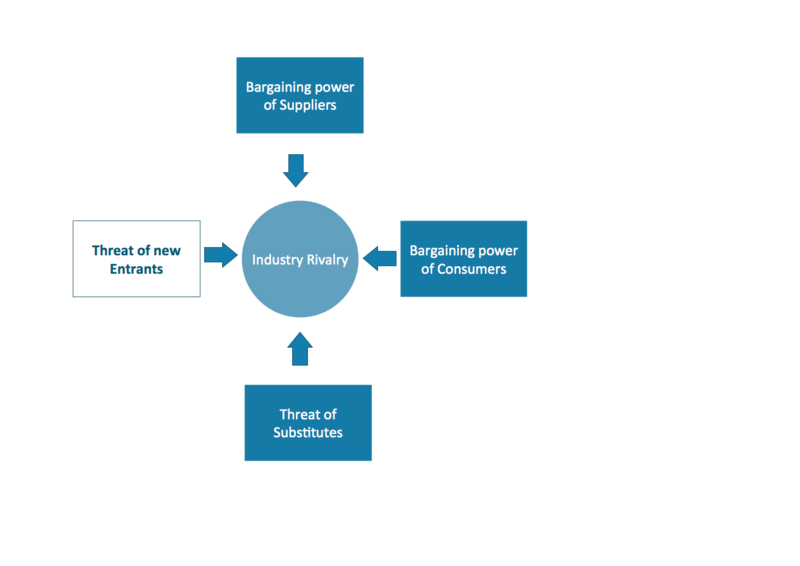 The pharmaceutical industry illustrates three major entry barriers. Initial capital investment, government policy, and technology propriety (patent). The pharmaceutical industry invents heavily in research and development to generate a promising medicine that they can patent and sell in the market for many years in the future. The pharmaceutical life cycle from an idea to introduction to the market is averaging around 8 years. The FDA takes at least one year to approve the drug and only three out of twenty drugs turn out profitable. The patent may prevent other pharmaceutical organizations from copying the formula, but the customer will find generic products, which have the same effect, in the market within one year after launching the drug in the market.